The most recent report from the U.S. Bureau of Labor Statistics revealed that the job market rebounded throughout the month of April, contributing to a lower unemployment rate. 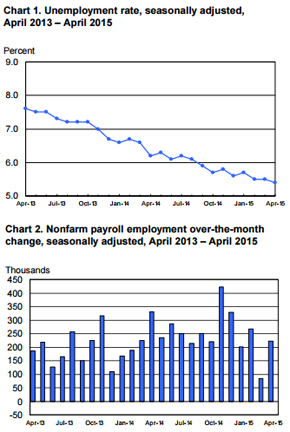 Overall, the nation added 223,000 jobs during April. Although this was slightly lower than the 224,000 jobs projected by economists, it demonstrated a return to the positive growth trend seen over the last 12 months, compared to the 85,000 positions added in March. About 62,000 of these jobs were in the professional and business service sectors, which had been averaging just 35,000 new positions each month. Within this larger field, services to buildings and dwellings added 16,000 positions, computer systems design and related services added 9,000 jobs, business support services grew its workforce by 7,000 and technical consulting services expanded by 6,000 positions. The healthcare industry created 45,000 jobs in April, with ambulatory care services gaining 25,000 positions, hospitals adding 12,000 jobs and residential care facilities expanding by 8,000 positions. The construction industry also experienced growth after having a stagnant March. The field gained 45,000 positions, with 41,000 of these jobs being specialty trade contractors. Transportation and warehousing gained 15,000 jobs. Sectors that saw little change in April included manufacturing, wholesale trade, information, retail trade, leisure and hospitality, government and financial activities. As a result of this significant job growth, the U.S. unemployment rate dropped slightly to an average of 5.4 percent. Bloomberg Business reported that this is the lowest jobless rate the country has seen since May 2008. The BLS report revealed that wages grew as well. Average hourly earnings went up by 3 cents to $24.87, while average hourly earnings for private sector production and non-supervisory employees grew by 2 cents to $20.90. Bloomberg explained that while any compensation increases are a positive sign of growth, these minuscule expansions are unexpectedly low compared to rates of overall job growth. “The pace of employment is quite encouraging. Wage growth is accelerating, but it’s quite gradual, more gradual than we would expect in a market where the unemployment rate is 5.4 percent,” Gregory Daco, head of U.S. macroeconomics at Oxford Economics USA Inc., told Bloomberg. The New York Times reported that the April employment data suggests the Federal Reserve will not be in any rush to take it’s long-awaited first step in raising short-term interest rates, which have been near zero since the onset of the financial crisis in 2008. According to the source, most experts now expect the Feds to move in September or beyond as the probable beginning of any gradual tightening effort by the central bank. View the full Bureau of Labor Statistics report here.